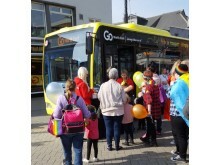 A yellow, rainbow-emblazoned bus had pride of place at Wearside’s LGBT festival and march this Sunday (24 September), as Go North East showed its support for the annual event. The region’s largest bus operator, Go North East is committed to championing diversity in the communities it serves and has recently invested over £2 million in upgrading its fleet, including the Sunderland Pride bus. 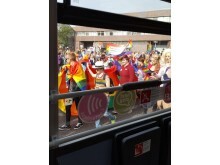 The brightly coloured bus, which took part in the seventh annual march on Sunday 24 September, bears the words ‘love, proud, carefree, unity and bold’ and the banner ‘Pride in transport, building communities together, celebrating diversity’. It is one of 64 to undergo a facelift, which includes repainting and renewing floors and seats, fitting USB sockets and accent lighting, plus adding free customer Wi-Fi and next stop audio-visual announcements. The investment has also improved mechanical systems, which will make the buses more environmentally-friendly thanks to lowered emissions and better fuel efficiency. 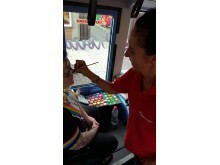 At Sunderland Pride, Go North East showcased its bus on the journey from the civic centre to Park Lane and entertained crowds with help from a face-painter and balloonologist. 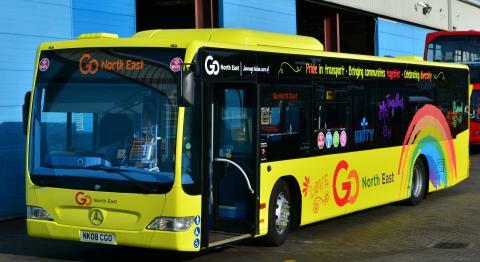 The second Pride bus in the operator’s fleet, the Wearside vehicle joins the original Tyneside version which has supported the past two Newcastle Pride festivals while providing transport services on Go North East’s popular Quaylink route. Stephen King, head of commercial and retail at Go North East, said: “Celebrating diversity is at the very heart of our company, so Sunderland Pride was the perfect platform to officially unveil our new bus, named in honour of this event.